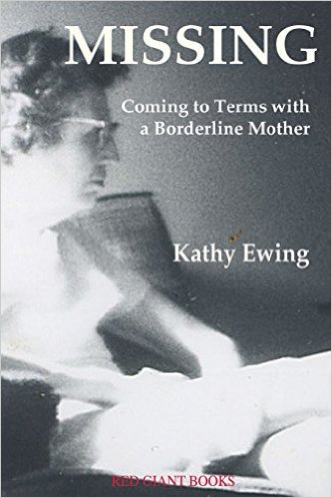 Author Kathy Ewing has written a beautiful, touching and insightful memoir, Missing: Coming to Terms with a Borderline Mother. Her book is about the impact and experience of being raised by a parent with borderline personality disorder. As I read the manuscript, I knew I had to have Kathy visit Survivingaborderlineparent.com (SBP) and answer a few questions. She generously agreed, and here is the result of our e-conversation. SBP: How did the idea to write a book, and specifically a memoir, come about for you? KE: It evolved gradually. I had learned a lot about borderline personality disorder in trying to help a friend. Then, in a sort of epiphany, I suddenly connected my mom’s oft-repeated refrain about my once being “perfect” (but then falling far short) with the black-and-white thinking associated with BPD. Almost immediately, I could connect some of my mom’s behavior with each one of the BPD symptoms. So I began writing them down, because I write partly to understand my own thinking. It was as though I was trying to prove to myself that her behavior really was consistent with BPD. My writing group had just begun about the same time, and I steeled myself to begin sharing a few of these very personal little essays with the group. They were interested and very encouraging, so I kept going. After awhile, as I tried to find books about mothers with BPD, I realized there might be a need and a market for a story like mine. SBP: You write about a gift you gave your mother that she set down on her dresser and never opened. What did that experience mean to you? What has that wrapped box come to represent? KE: That wasn’t even a “story” in my mind, until, as I describe in the book, I shared it with a friend. She and I were talking about Avon products in kind of a joking way, and suddenly that memory came to mind. I had wrapped up a little bottle of cologne for my mom’s birthday, and since she recognized the size and knew what it was, she never opened it. I began to realize that this story was weirdly symbolic of something missing in my mom, an inability to connect. One of my writing group friends remarked that this anecdote, for her, is the key to the whole book, because I myself was the gift my mother never opened. This was the first experience I had of a reader seeing more in my story than I had actually perceived myself. SBP: Now that you have some context for the confusing, sometimes heartbreakingly disappointing and hurtful childhood experiences, what would you say to your younger self? What would have been helpful for you to hear from the adults around you as you were growing up? KE: I would borrow Dan Savage’s advice for young gay people: It will get better. My mom’s neediness and anger felt smothering at times, and it took me some years to break out and breathe, but it happened. If I could have understood then that she was genuinely suffering from a mental illness, I think I would have felt less resentful. Any adult acknowledging that my mom’s behavior was odd would have changed everything for me. The few times my dad spoke up and contradicted her meant a lot. SBP: How did your childhood experience with a borderline parent influence your decision to have children, and your parenting? In what ways did your mother’s parenting serve as a positive model, and in what ways did it serve as a reminder of what you did not want to do with your own children? KE: I think I believed, a little arrogantly, perhaps, that I could do a better job than my mom. And my mom was a positive role model in some respects: she cooked a family dinner seven nights a week, she shared some laughs with my dad and with us, she tried to attend our concerts and activities, and so on. Other things were very difficult for her, and I struggled with some of these tendencies myself as a parent. She was moody and would lash out for no reason. 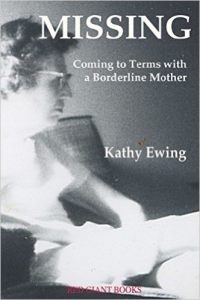 (The writer Christine Ann Lawson, author of Understanding the Borderline Mother, calls it “The Turn.”) She made sure we knew she was unhappy most of the time and reminded us regularly that we had disappointed her. She was missing (hence, my title) too often when we needed her emotionally. I tried to do better with my own kids. SBP: Your father — you write about how he was such a tremendous presence in your life. In what ways did he help you deal with your mother’s “absence”? I recently finished a project related to helping the children when one’s partner has BPD. One of the themes that emerged over and over is how important it is for kids to have a strong and healthy bond with at least one adult. In what ways did your dad foster that kind of relationship between the two of you? KE: Questions arose as I began sharing parts of the book about how much of my dad to include, when the book is ostensibly about me and my mom. But I think what you’re saying is so important. I had a funny, smart, courageous dad who, though he wasn’t warm and fuzzy, provided a loving example to me and my sisters. Despite his physical disability (paraplegia), he was positive and involved in our lives. I describe how, for example, he once drove me to a day-long music contest and sat in the car by himself all day waiting for me. He read the books I loved and talked about them with me. He asked me questions about my friends and my life, which my mom never did. It’s so simple, really, but so significant. SBP: Can you describe, or summarize, the process you went through to understand, and free yourself from, or make peace with (in what terms do you think about it? ), the effects of being raised by a parent with BPD? KE: I don’t think I’m exactly free or at peace, but I understand better what was going on with my mom and what happened to me. I’m certainly more peaceful than I was before researching and writing. I used to brood about my mom and mull over things she said to me. I’ve exorcised most of that in the writing. Trying to grasp fully that my mother couldn’t help the way she was has nudged me along. I wrote in my blog recently that it’s more healthy to assume she did the best she could than to stoke my resentment that she could have done better. I suffer residual effects still, I think. I can lapse into gloominess and feel like a martyr sometimes, but now I’m better able to see myself doing it and resist the temptations. SBP: It’s an ongoing process… Since writing and completing the manuscript, have you had any new insights into your childhood or BPD? KE: Yes, the insights are still coming. I’m starting to be able to see my mom as loving. That is, I can empathize a little bit more with her as time goes by. Our love for our children is deep and overpowering, and if you have an emotional disability that prevents you from feeling deeply, or at least from expressing deep feelings appropriately, parental love must be almost debilitating. More and more, my experience becomes very much what Mary Oliver expressed so beautifully in the poem that serves as the book’s epigraph: Someone I loved once gave me/A box full of darkness/It took me years to understand/That this, too, was a gift. Just the sharing I’ve been able to do so far, for example, with people who’ve had similar experiences has been enlightening. I’ve met people through my blog, long before the book’s publication, who’ve become valuable friends. I’ve maintained my friendship with Nancy, the woman with BPD without whom I would never have made the connection, and I learn more from her all the time. I feel in general more humble and less judgmental, though I have a long way to go. SBP: What do you most hope readers, many of whom I’m assuming will have been raised by a borderline parent, gain by reading your book? KE: If your parent with borderline personality is alive and present in your life, it can be extremely hard to be understanding and empathetic. You can hardly help being caught up in the moment. I hope readers will see that things can get better, as I said, if you’re patient both with the parent and with yourself. When your parent says something cruel and disapproving, you can think, “That’s not them. That’s the disease.” Getting help and support for yourself is key. Reading books like mine (and Surviving a Borderline Parent!) can demonstrate that you’re not alone. My sisters have been great supports. In addition, I’ve discovered a whole little community of women with mothers like mine, and we can share our experiences with empathy and also large doses of black humor. Humor helps, when you can muster it. SBP: Thank you, Kathy! Readers, you can order Missing: Coming to Terms with a Borderline Mother from your local independent bookseller, which Kathy suggests, or via Amazon. The “search inside the book” feature is not enabled on Amazon, but you can read an excerpt on Kathy’s website, here. 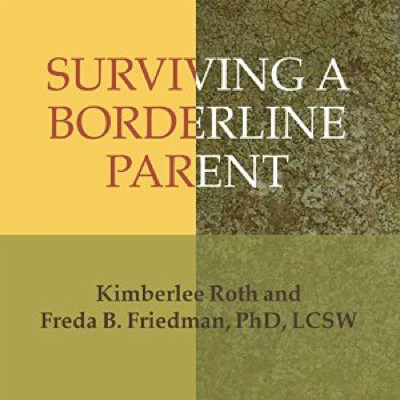 Surviving a Borderline Parent Audiobook Available! Happy Audiobook Birthday to SBP! 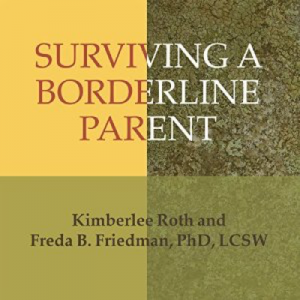 Surviving A Borderline Parent is now available, unabridged, in audio format, including audio CD, MP3-CD and Audible. Experienced narrator Pam Ward reads. You can listen to a sample of the audiobook here. Researchers at the University of Georgia are looking for adult children who believe they had narcissistic parents (diagnosed with narcissistic personality disorder or not) to participate in a study about the impact of parental communication. The information below contains a link to the questionnaire. 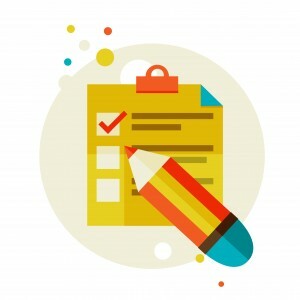 There is a consent form at the start of the questionnaire, which provides additional information and contact information if you have questions or would like to receive a summary of results once the data are analyzed. My colleague and I are researchers at the University of Georgia collecting data for a project examining how parental communication impacts individuals once they are adults. There is presently no published scale that measures parental narcissism behaviors from the perspective of the adult child, and very little research in general. Not surprisingly, we would like to have ACONs (adult children of narcissists), if they are interested, participate in our study. We currently are collecting data via a questionnaire that asks about ACONs parent’s communication style(s) and some items that measure personality characteristics of their parent or legal guardian that they identify as a narcissist and themselves. There is a need for more research and empirical understanding of ACONs and how they are impacted by their parent(s). In addition, participants may choose to enter a drawing for one $100 gift cards for participating. The entire process will require less than 30 minutes of their time (closer to 20). Of course we will keep all information confidential, so that names and other identifying markers (e.g., IP addresses) will not be linked to the questionnaire they complete. Participants who are interested in the drawing will enter an email address into the drawing – email addresses will not be linked back to the questionnaires. We are keeping this current study active through June. The data will be analyzed, assessed, and compiled throughout July. In July a summary report will be sent to all participating website administrators we are aware of. Aside from this summary report of the results, my co-author and I are hoping to publish in an academic journal. We have an extensive consent form (also attached) participants read through before they proceed to the questions which let they know the purpose of the study, what to expect, benefits, risk, and contact information. The consent form as well as the rest of the study underwent an Institutional Review Board (IRB) application through the University of Georgia to ensure the study was upholding ethical standards. It is important that the ACON perceives the parent as narcissistic even if s/he has not tested for or does not have NPD. We truly appreciate your help and we hope through this study that we can create a short useful questionnaire for people to use to help identify narcissistic parents.